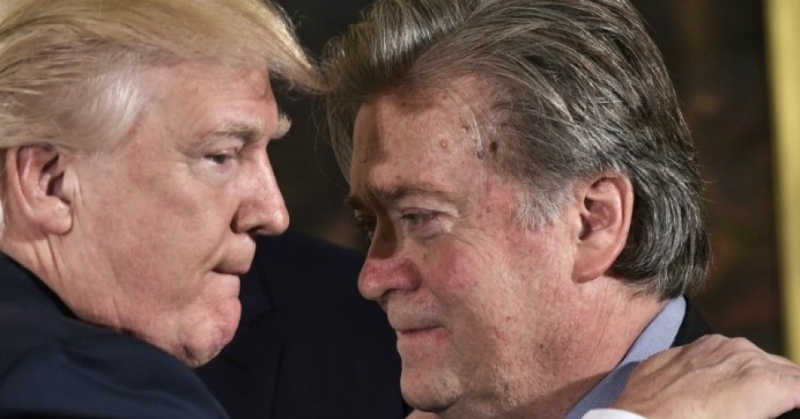 President Donald Trump, chief strategist Steve Bannon, senior policy adviser Stephen Miller, and a select few others are consolidating significant power in the White House, observers warn—setting the stage for what some describe as a coup d’état. As evidence, many are pointing to the weekend’s news that former Breitbart News chair Bannon had been appointed to the National Security Council’s (NSC) “principals committee”—while the director of national intelligence as well as the chairman of the Joint Chiefs of Staff were demoted to attend NSC meetings only on an as-needed basis. That move, “politicizing the process for national security decisions, suggests Mr. Bannon is positioning himself not merely as a Svengali but as the de facto president,” the New York Times wrote in a damning editorial published in Tuesday’s paper. As his first week in office amply demonstrated, Mr. Trump has no grounding in national security decision making, no sophistication in governance, and little apparent grasp of what it takes to lead a great diverse nation. He needs to hear from experienced officials, like [Joint Chiefs chairman] General [Joseph] Dunford. But Mr. Bannon has positioned himself, along with Mr. Trump’s son-in-law, Jared Kushner, as the president’s most trusted aide, shutting out other voices that might offer alternative views. He is now reportedly eclipsing the national security adviser, retired Lt. Gen. Michael Flynn. To review: Trump is either firing or sidelining the top officials (military, State, AG, ICE) who might stand in the way of Bannonite chaos. Master of Distraction cont’d: The (justifiable) outrage over Muslim Ban diverts attention from Bannon coup ousting intel chiefs from NSC.